Vienna International Airport, the biggest airport in Austria, is the gateway to Europe. Situated in the town of Schwechat, it connects to a network of European destinations and offers flights to destinations in Asia, North America and Africa. The airport easily handles wide-body aircraft, including the Airbus A380. In 2016, 23.4 million passengers passed through the airport’s doors. Vienna International Airport (IATA code: VIE) is the busiest airport in Austria and a hub for Austrian Airlines, Eurowings Europe, easyJet Europe and Air Cairo. Flights to Vienna International Airport are provided by international airlines such as Air China, Ethiopian Airlines and Qatar Airways. VIE is a 20-minute drive from the city centre of Vienna. Book your cheap flights to and from Vienna International Airport online! Get ready to discover the capital of Austria with flights to the beautifully situated Vienna International Airport. The busiest airport of the country sits in a scenic location, close to the Danube River. VIE welcomes passengers with four terminal buildings, named Terminal 1, 2, 3 and 1A. From Vienna’s hub airport, you have the gateway to the world! The major activity that characterises VIE has earned it a place as one of the busiest airports in Europe. While it was able to handle more than 23 million passengers in 2016, Vienna International Airport actually has the capacity to welcome 30 million passengers per year! If you have some spare time at Vienna International Airport, spend it by doing some window shopping or get all your essentials for a trip to the capital of Austria. A variety of retail outlets are available throughout the airport, selling items such as jewellery, electronics, accessories, cosmetics, fashion, snacks, groceries, and duty-free products. All that shopping will definitely leave you with an appetite and a need to just rest your feet. Do all that at the various restaurants, cafés, fast food outlets, bars and wine lounges at Vienna’s hub airport. Vienna International Airport offers you the chance to relax at a number of cosy lounges before your next flight. These settings providing comfort include buffets, alcoholic and non-alcoholic drinks, free W-Fi, newspapers, magazines, relaxing chairs, showers and smoking cabins. 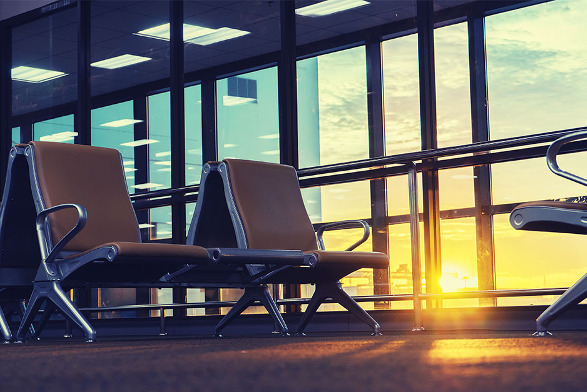 These lounges are free of charge to passengers with first and business-class tickets, frequent flyers of various airlines, as well as holders of various credit and membership cards. For any health concerns, the airport includes a pharmacy, while serious medical issues can be addressed at the Medical Centre in the Arrivals level. Make sure to follow the baggage restrictions when you’re at Vienna International Airport. There are plenty other facilities and services that you can enjoy at Vienna International Airport. These include free Wi-Fi, workstations, business facilities, conference centres, meeting rooms, currency exchange facilities, luggage services, visitors terrace, and prayer rooms. A multimedia area educates visitors about the aviation industry from the perspective of the cockpit and from the air traffic controller. Moxy Vienna Airport This contemporary 3-star hotel in Schwechat is within walking distance of Vienna International Airport. Amenities include a restaurant, bar/lounge, conference space, front desk safe, arcade/game room, air conditioning, fitness centre and terrace. Free Wi-Fi is available as well. NH Vienna Airport Conference Center This stunning 4-star hotel is within walking distance of the airport. It comprises of several features, such as a front desk safe, air conditioning, daily housekeeping, business centre, massage/treatment rooms, fitness centre, restaurant and bar/lounge. The establishment additionally offers free Wi-Fi. Grand Ferdinand Vienna - Your Hotel In The City Center This gorgeous 5-star hotel near the Vienna State Opera is a 20-minute drive from Vienna’s airport. This establishment is home to features that will guarantee you a comfortable accommodation experience, such as 3 restaurants, outdoor pool, breakfast, fitness centre, valet parking, shopping centre shuttles, terrace, air conditioning and daily housekeeping. Free Wi-Fi is available as well. You can order foreign exchange as early as 60 days before collecting. Take note that collections can only be done in person. Vienna International Airport offers numerous parking spaces in a multi-storey car park. These parking bays are available for short and long-term stays. You can reserve a parking space beforehand by visiting the airport’s website. Vienna International Airport sits 18 km to the southeast of central Vienna. You can easily travel to and from the airport with transport options including car rentals, taxis, trains, buses and Uber.